We also carry used instruments for sale!!!!!!! 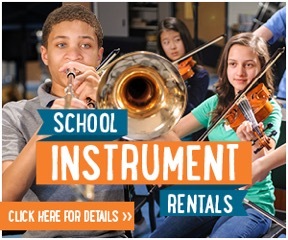 M&M Music is affiliated with Music & Arts for all of our band instrument rentals. We rent almost every band instrument, including saxophones, flutes, clarinets, trumpets, trombones, violins, cellos, etc. If you would like to rent an instrument, please come to our store and fill out a rental agreement form. Instruments can be rented in 4-5 or 9 month intervals. Prices vary from instrument to instrument, so please refer to the specific rental contract for the final price. With each rental, you may choose to include a no-deductable LDW (Liability Damage Waiver) which covers the cost of any and all wear-and-tear repairs, or in the case of any premature damage to, or theft of the instrument. According to the Music & Arts website, homeowners insurance does not cover the instruments. You may cancel the coverage at any time, but you may only include it at the time of the rental agreement. If you choose not to include LDW, you are financially responsible for loss, theft, damage to, or destruction of the instrument. We also provide PA system rentals at M&M Music. We have multiple systems, sure to accomodate the size and function of your event. Microphones, speaker and mic cables are included in the price of the rental. We have several types of systems for rent. PA systems are rented on a first come, first serve basis, so be sure to reserve yours in advance to guarantee that we will have one available on the day of your event. To reserve a PA system, either call or fill out the form below. Please clearly specify whether you need a small, medium or large PA, the type of event, and the number of microphones you need. You must have a valid credit card in order to rent a PA system!